Is the topic of the play Veils, which opened at West of Lenin produced by Macha Theatre Works. Written byTom Coash, a former professor at the American University of Cairo, where the play takes place, just prior to the Arab Spring in 2010 and 2011. It has multiple layers of conflict, focused around whether Muslim women should wear the traditional veil or not; and almost all the complex nuances of this issue. Embedded into this central conflict is a long discussion of how religious identity, as opposed to religious faith, and the external symbols of religious identity can be manipulated, exploited and distorted for secular purposes. But be not alarmed dear audience, it is also a very human story about how two people adjust to each other and how a foreigner adjusts to a new culture, while being at the same time an extremely funny play. In these days of extreme toxic political bias, the playwright approached this subject objectively and humanely. As the play opens, Intisar, a cradle Muslim, from an upscale neighborhood in Philadelphia, is waiting at the Cairo airport, having just arrived for her Junior year abroad at the American University of Cairo. She and her prospective Egyptian roommate, Samar, are anxiously trying to find each other using cell phones, but are totally incredulous, when they do meet each other. 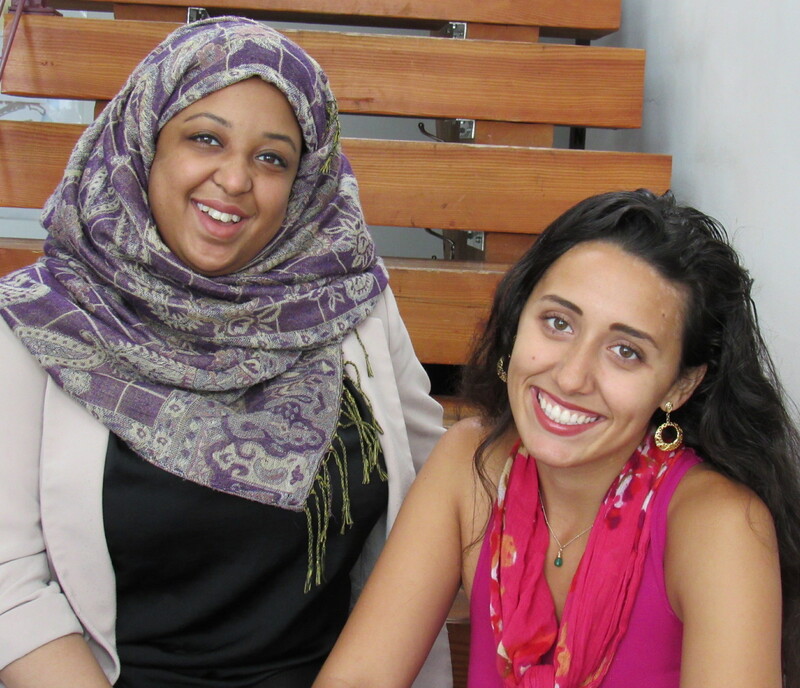 Samar, the Egyptian student is dressed in what would be described as fashionable Western dress, in tight jeans; Intisar, the American Muslim, is wearing a head scarf, a long skirt and long sleeves. Although they each expected someone different, they bond together and have long discussions about what it means to be a Muslim, what it means to wear a veil, or not to wear a veil, in their prospective countries. Though the play covers most of the points of view about the veil except that the origin of the veil predates Islam; it had a practical use in dusty windy desert climates, where water had to be conserved for drinking rather than washing hair, it kept your hair clean. Its use as an instrument of modesty, male oppression, and political symbol came later. Intisar, for whom Islam is a question of spirituality and faith, which emotionally and psychologically sustains her during life’s difficulties, wearing a veil is a symbol of being proud of her faith, in a country where Islam is a vilified minority religion. But she grew up in a country with a long-standing written constitution, stipulating a separation of church and state, as well as guarantees of religious freedom in our bill of rights; for her it is a personal choice. Samir, on the other hand, chooses only to wear the veil in the mosque, and fights against religious authorities writing secular laws. She believes that banning the “tent” as she calls the full body burqas is a good thing, because she fears that it is the first step towards imposing Sharia law. Her position is perfectly reasonable in a volatile country with powerful religious political factions vying for power who are more than willing to exploit religious identity for political gain. After the intermission, in Act II the subject of the play changes as the Arab spring erupts; each roommate has to make their own personal decision about how to react. Although Act II seemed to be tacked on and was almost an entirely different autonomous play, while using the same characters and setting, it was not totally beside the point. The structure of the play was the weak point, the strength of the play, and it was the strength of steel, was the astute amusing dialogue, which mocked perceived ethnic stereotypes uncontemptuously, the challenging subject matter and the technical aspects of this production. Alaji, who played Samar stole the show by making the dialogue come alive, and the rapport between the two roommates was full of energy and wit. The playwright’s depiction of a strict Muslim girl from Overbrook (the first town on Philadelphia’s Main Line) who was fairly streetwise and sarcastic, did not seem all that believable, but she did put in a decent performance. As Scenic and projection designers, Parmida Ziaei and Suzi Tucker, respectively, as well as director Lia Sima Fakhouri, used power point slide projections to creates the “set” complete with scenes of the pyramids, camels and most effectively crowd scenes of the revolution. Sound designer Johanna Melamed created the sounds of Cairo traffic, the call to prayer, and the hopeful but scarey sounds of the revolution. I heartily recommend this production, it was thought-provoking, amusing, and had a lot of jokes about Americans abroad, our expectations, our tendency to think that we can change the rest of the world as well as the nuances of an extremely complex global issue. Covering one’s had has had a long tradition in the West as well. Info. www.machatheatreworks.com. Photos by Joe Iano.